My first memory of a basketball was when I was still in diapers, running up and down my grandparents' apartment complex in Philadelphia with a little basketball and hoop. There are pictures of me to prove it! Mom and Dad were "hard" on me, as parents can be on the firstborn. My dad was very disciplined with me — which was good! — and even when my little sister and I would fight at times, it didn't matter: I was getting blamed for it! I grew up in Kingwood, TX. Middle class. Nice neighborhood. Good people. My friends from elementary, middle, and high school — we all stayed together. Probably 99 percent of my friends live in Kingwood today, married, with families. We'd skateboard at times. We did it all. As I got into middle and high school, I'd play one-on-one at the elementary school with one of my buddies on the basketball team. Then when I got to high school, we'd play hoops all the time. It really wasn't until high school that I focused strictly on basketball. In fifth grade, I remember sitting in my parents' room watching the Lakers play the Celtics on television. I remember telling my dad that I wanted to play in the NBA. It wasn't that I wanted to coach, necessarily; I wanted to play. But I knew that if I couldn't play in the NBA, I still wanted to stay in the game, and what's the next best thing to playing? Coaching! So I threw a lot of my energies into preparing for a career in coaching. But I still worked extremely hard on my own individual playing game, thinking that one day I — maybe, hopefully — could get a shot. As I got older, especially when I got to college, I realized I was not going to make it to the NBA level as a player. In high school, I was on the freshman B team. My sophomore year, I didn't make the JV team. So I had some setbacks along the way. It wasn't all roses. I look back, and some of those times were good for me because it made me that much hungrier, made me want it that much more. It hurt me, but it drove me. When it came time to apply for college, I sent a personal, handwritten letter to every single school in America from NCAA Division I to NAIA. The only school to personally respond back was Arizona. At the University of Arizona, I completed my undergraduate degree in two and a half years. I felt that if I wanted to be a head coach at the college level, I'd need to be prepared to deal with deans and presidents in the academic arena, as well as with student athletes. I thought, okay, I need to walk the walk now so I can talk the talk later. As a coach, I knew I'd be emphasizing the importance of education to my players. I also knew they'd come up with excuses why they couldn't keep their grades up. I wanted to be able to tell them, "Hey, I was a student athlete, too, and yet I completed my bachelor's in two and a half years and my master's in one." So that was my thinking on that. And yes, I wanted a coaching job that badly. I knew what I wanted to do in my life, but I knew I needed to take care of my business academically, so I said, "Let's get this done." If you want to achieve something, you're going to have to sacrifice. Did I sacrifice going out Friday and Saturday nights? Yeah. But that's part of it. If you want to reach a goal, you're going to have to do that. I was in my sixth year as the assistant coach at the University of Arizona when Memphis made me the offer in 2008 to be the Tigers' assistant coach. It was hard to leave Arizona because I loved being there, but when Coach Calipari called me up and asked, "Do you want to come?" I jumped on the opportunity strictly because of him. I thought it would be good for my resume. At the time, the Tigers were enjoying their most successful run in school history. That first year, I worked with Coach Cal to continue that success. Memphis ended the 2009 season with a fourth-straight Sweet Sixteen appearance and a school-record 27-game winning streak. When I first realized that Coach Calipari was leaving Memphis at the end of that season to be the head coach at the University of Kentucky, I was so excited that I would be going to Kentucky, too! He and I immediately started talking about recruiting and where we needed to head, and I was getting the schedule all set. That was how far we'd gone when things turned around. On a Sunday night, I was giving Coach Cal my recruiting plans for the Kentucky team. 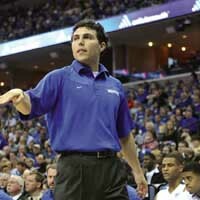 By Monday afternoon, I was the head coach at Memphis! It was a shock when they offered me the job. I stepped outside, and I called Cal. But you only get these kinds of opportunities once in a while, and head coaching jobs are hard jobs to get. So I had no choice but to take it — and I'm glad I did. The first thing I did after being named the Tigers' head basketball coach was go into survival mode! After Coach Calipari left, I had to get the team rallied up, find recruits, and get the team back on its feet. Strictly survival mode. I was most nervous about two things. One, stabilizing the program. Two, hoping that the Memphis community would give me the same amount of time it has given other coaches, because I knew it wasn't going to happen overnight. I understood the success and the level of the team when Calipari left, so I hoped people weren't expecting my first year to be the same as the last four under Coach Cal. This was going to take time. My favorite part of a game is winning. The toughest part of the job … managing egos and personalities. I call it wearing my loose-fitting clothing. I've got to have plenty of room to adjust, to move! I manage to keep my cool on the court by being spiritually connected. Before every game, I try to get a workout in — running. After Calipari left, I told the team … I was very honest with the guys. I said, "Hey, you guys inherited me. I didn't come here to become the head coach, and you didn't sign here to play for Josh Pastner. I respect that. But guys, bottom line, we can either sulk and complain or we can decide to do this together, have fun, and have a great year." When I disagree with a call, I tell the ref in a gentleman's way. Sometimes I don't always do a good job of that, but I don't use any profanity. They are human beings, too. Refereeing is not an exact science, and they try to do the best job they can. What I like least about the coaching world are the egos involved. There are many, many egos throughout this profession. The trick to recruiting talent is hard work and honesty. There's no secret to it. My cell phone minutes average is off the charts! I'm talking world records, here! In my basketball world, my wife supports me. I can always tell when she's been talking to fans when she tells me things like, "You need to be playing zone more," or "You should get onto the refs more." (laughs) She enjoys the game. My favorite thing to do after a game is go home and hang with the family. Whether I win or lose, I do the same thing: I go home. During a game, I get angriest when we don't play with all-out effort. I'll call a timeout and try to jumpstart them, or if that doesn't work, I'll sub them. Then you have their attention. As a teenager, I wrote scouting reports and traveled with my father's summer basketball team. By age 16, I was the head coach and organizer of AAU's Houston Hoops. From my father, I got my positive attitude, good discipline, and being good to people. My mom — she was a stay-at-home mom and strict on me, as well — was very truthful with me. She told me like it was. When I needed a good pick-me-up, I went to my dad, because if I didn't play well in a game, my mom flat-out told me! There was no sugar-coating it. And I am glad of that. I have never had a sip of alcohol. During a game timeout everyone is extremely focused. People don't always understand the energy. You've got 17,000 people in there. There's high energy. That's why it's so important for the team to have what I call laser-like focus. When we lose that, that's when bad things happen. The biggest reward in a coaching career is making a positive difference in these young men's lives. If I could meet one person … Pat Tillman. The sacrifice that he made was just amazing. Here's a guy who was a millionaire and professional football player, and he gave it all up to fight for his country. The most valuable lesson I was taught is that there is no greater feeling than going to sleep at night having peace of mind. Best feeling you can have. Priceless. I achieve peace of mind by always being honest. No secrets. Most people don't know that I have never had a sip of carbonation. My parents never gave it to me when I was young, so I never grew up with it. I thought, what a neat fact to say I've never had soda! I've never tasted Sprite, Coca-Cola — and I'm not really curious about it. My biggest vice is I've got a sweet tooth. M&Ms. Plain. The biggest misperception many people have about coaching is that it's just coaching. It's not. A lot of it is dealing with personalities, speaking engagements, recruiting, community appearances and activities — it's not as much "coaching" as people think. When a student tells me he wants to coach, I say, "If you just want to coach, the professional level might be a better fit. In college, there are so many other things you have to do other than just coach a team." There's a lot of involvement. As a college coach, you're there 24/7/365. If a player gets into trouble off the court, the university and the coach are responsible. I try to cover the do's and don'ts with my guys every day. I'm always mistrustful of unprincipled decisions. I decide which suit to wear to a game by picking whatever strikes me five minutes before I leave my house to go to the arena. One of my biggest concerns is making sure people know that we're trying to build a program. And just like with Coach Cal, Coach Finch, Coach Bartow, Coach Kirk — none of those guys succeeded overnight. It's going to take time to build a team, and as much as I wish I could, I can't wave a magic wand to make it happen right away. I pay a personal price when I start projecting the future and don't stay in a center-state, present state of mind. When I stray from that, I start getting stressed because life starts becoming fear based. I'm not easily rushed. I don't make impulsive decisions. I need to sleep on things. My final 2 cents … I am so fortunate to be a part of this community. I've said it many times: The Tigers are the city's team. I'm just a gatekeeper to make sure everyone remains proud of their basketball program. This program really revolves around the city. It's about the city, and the city is so emotionally invested in the program. People love Tiger basketball, and they're passionate about it. And that's just so unusual, so unique. This program was good way before I came onto the scene — way before I was even born! — and the program is going to be really good when I'm long gone. This is about the Memphis name, and that's what I think is pretty powerful.